After our first night at Lake Rudolph Campground we rode the shuttle next door to Holiday World just in time for the gates to open. So began our day of conquering their four coasters. Our first ride was on Raven. This wooden coaster mostly hidden in the trees follows the terrain and also juts out onto Lake Rudolph. It was a great ride, just a little intense and not a rough spot. But ultimately it is too short of a ride. The second coaster we rode was Legend. This coaster was longer and more intense than Raven. Legend had a wild helix and lots of direction changes. There were only a couple minor rough spots. It was a great and wild ride. Howler was the third coaster we rode today. It was a fun little family coaster. We just had to ride it to get the credit. Our final coaster of the day was Voyage. This was a monster wood coaster. Voyage is by far the most intense wooden coaster I have ever ridden. It is so fast and it's twists and turns are out of control and come very quickly one right after the other. There are a couple rough portions along the track. It is so fast, so intense and a bit rough I don't know if I like it. Maybe it is too intense. Or maybe I'm starting to get old. Midway through the day the heat was getting to us, so we decided to go to the campground and change into our swimming suits. I think we rode every single adult slide in the water park. It was a great way to quench the heat. Also during the day we rode Liberty Launch, Frightful Falls, Eagles Flight, Turkey Whirl and The Freedom Train. Sarah took a solo ride on HallowSwings. I was impressed with the themeing on Raging Rapids. To our delight Gobbler Getaway was a nice surprise and a lot of fun. The parks newest ride and the world's tallest water ride; Pilgrims Plunge was a huge rush. It was a total blast! The free unlimited soft drinks throughout the park were a great bonus. Cedar Point with their 22 oz. drinks for $3.59 really needs to open their eyes. The weather was mostly sunny for most of the day. The Park was very clean with lots of trees and green space. The staff was friendly. Tomorrow we head north to Monticello, Indiana for a visit to Indiana Beach on Friday. 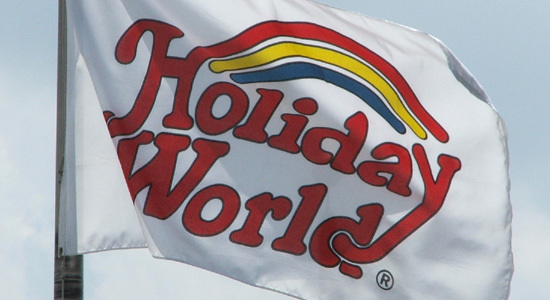 Check out my photo album of Holiday World.